Probably I mention that Cookies often comes back very late from work and unfortunately he doesn’t believe into eating before he goes so his last meal is very late. And since one of the rules in The Mullen Household is to eat at least one meal a day together I mostly wait with my meal until he comes back. This snack I put together one evening when I had quite a headache and I didn't want to spend too much time in the kitchen. 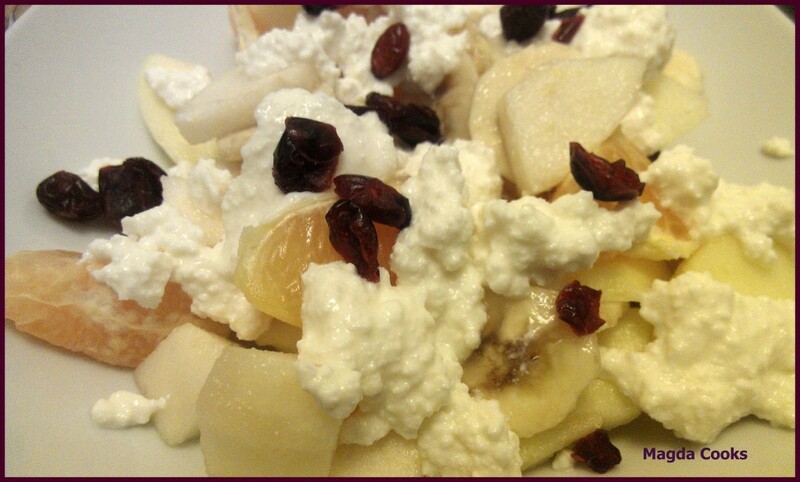 It’s a fruit salad with some cream cheese. This idea can be used in many ways – as a light snack in the evening, as a dessert or easily even to be packed to work for lunch. Actually did that once and I was surprised how filing it was. Peel what needs peeling 0_o. Cut into bite size pieces and combine in the bowl. Using a fork smash cream cheese with sugar and if too thick pour a little milk (I don’t give amount cos you should do it to your own liking). Stir in sugar and vanilla and make sure everything is mixed thoroughly. 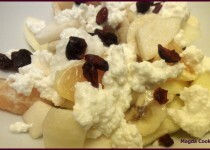 Divide fruits to prepared plates/bowls add cheese mix on top and sprinkle with cranberries or raisins. P.S. Cookies thoughts: It was good for the time I ate it, and actually it was really light on my stomach, no nightmares (from eating at least... I had nightmares from OTHER THINGS though...) Magda Cooks... well, wait, she didn't ACTUALLY cook anything this time, so lets change it, Magda … hmmm, made it JUST RIGHT?